The judging panel for the inaugural UK Cookery School of the Year Awards 2012 was both excited and impressed by the sheer quality and originality on display by cookery schools and their staff throughout the country. The awards were set up, in conjunction with Tabasco Pepper Sauce, to recognise outstanding achievements in an industry that remains largely unregulated and the positive response from hundreds of schools far exceeded our expectations. Choosing an overall winner from such strong shortlists was a tough task. In some cases there really was no more than a wafer thin margin between the candidates. Other winners included the Vegetarian Cookery School in Bath, which continues to innovate and delight students and the excellent hands-on Food Safari courses run by Polly Robinson in Suffolk, which in many ways redefine the cookery course experience. 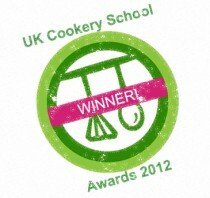 We were heartened to see such a strong response to the Best Community Focused Cookery School category. 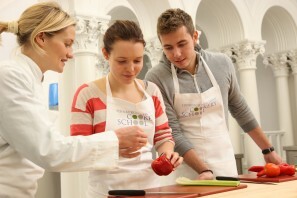 Cookery schools provide such a great platform to engage with local communities and people of all ages and backgrounds. This was one of our longest shortlists and one of the toughest decisions for the judges. The Square Food Foundation in Bristol edged it for its range of highly useful and accessible courses for all sectors of the community. At a challenging time for cookery schools, The Orchards School of Cookery has gone from strength to strength by tapping in to a niche and offering practical but fun courses for younger people wanting to learn how to cook. Jamie Oliver’s Recipease is another winner that has found a formula to keep the customers flowing with its simple but appealing short courses often just focused on one dish. There are a lot of polished chef/teachers out there and some larger than life characters but John Benbow beats the competition as the hard-working and charismatic boss of the popular Food at 52 cookery school in London – time and again we’ve heard of students who have come away from a course with him and been inspired by his passion. In each category, our final decisions were only partially influenced by customer feedback but it was hard to argue with the flood of glowing comments – many of them career-changing – that we received from alumni of the Tante Marie Culinary Academy, which scooped our prestigious Best Diploma Course award. Finally, thank you to everyone for their entries, there were many schools doing great things that didn’t quite make the shortlists for one reason or another. There’s always next year! I have completed 3 courses with John, and have to say I am so glad he won an award. He deserves the credit as he is fantastic. I have coked the recipes often since. So many congratulations to such an inspiration. I’m so pleased for Fiona Burrell, she works so hard and this is truly deserved.